Joshua Hammerman wants to amplify the importance of being a mensch in a world with a surplus of discord. “One isn’t born a mensch, nor is it a status that one ever completely achieves; for to boast that you are a mensch is, by definition, not to possess the requisite humility to be one,” says Hammerman, rabbi of Conservative, egalitarian Temple Beth El, Stamford, Conn.
“In a world as dehumanizing as ours has become, simply being a kind, honest and loving person, a man or woman of integrity, has become a measure of heroism,” he says. The word “love” recurs throughout, and pieces have titles such as “Rising Above the Hate,” “Shedding the Baggage,” “Fathers and Sons,” “The Invisible Fence,” “Numb and Numb-er” and “My Brother’s Keeper,” in which he discusses having a disabled brother, implicitly urging us to see the person inside the disabled. There’s a lovely essay on appreciating the beauty of nature and the limits of our human power. 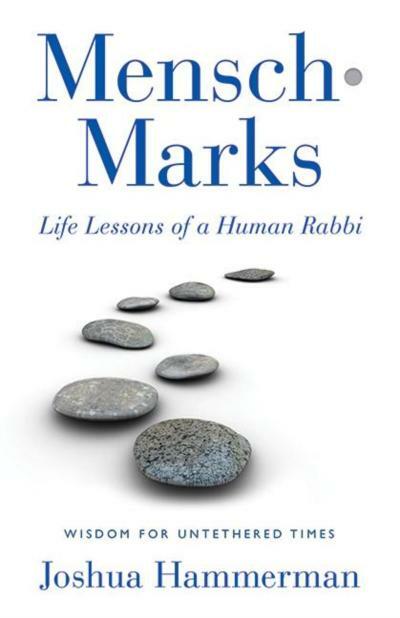 Most of the 42 steps expand on behaviors taught by good parents, but Hammerman — 2008 winner of the Rockower Award for excellence in Jewish journalism and the 2018 Religion News Association award for commentary — is a clever writer with some humanizing self-deprecation and delightful turns of phrase. Hammerman avoids self-congratulation despite a close brush in his introduction: “I’ve devoted my life to trying to become a more fully realized, morally evolved human being, a person of character. There’s little here with which to disagree; everyone can benefit from more menschlichkeit, both as givers and receivers. But I don’t understand why he thinks American Jews should vote in Israeli elections. Citizens vote. “Superrabbi, the flawed model” is subtitled: “Taking myself off the pedestal.” In a time of “widespread sexual, financial and power abuses by clergy, it never has been more important to stop deifying them,” he says. His model for himself is “as a co-traveler, a very well-educated member of the flock,” sharing his experiences and learning from theirs. His longest piece tells how an essay speculating on the disorderly result of the 2011 Super Bowl victory led by the hugely admired Tim Tebow brought national notoriety, with accusations of insulting evangelicals. Included is his 2012 Yom Kippur sermon about his error, how everyone makes errors or feels failure, and how even God forgives. Forty of Hammerman’s mensch marks appeared earlier, mostly in New York’s big newspaper The Jewish Week. For some, he has written introductions or added material. He explains the title’s dot, which appears throughout. His publisher doesn’t expect a bored reception: A first printing of 15,000 is much greater than for most nonfiction books. “In a world that lacks humanity, be a human” is close, but not quite the same. Even Hammerman, hospitalized with kidney stones, tells himself: “Man up!” Good or bad, people are humans. Hillel is describing behavior — menschlichkeit equally available to women, who perhaps more often are its practitioners.